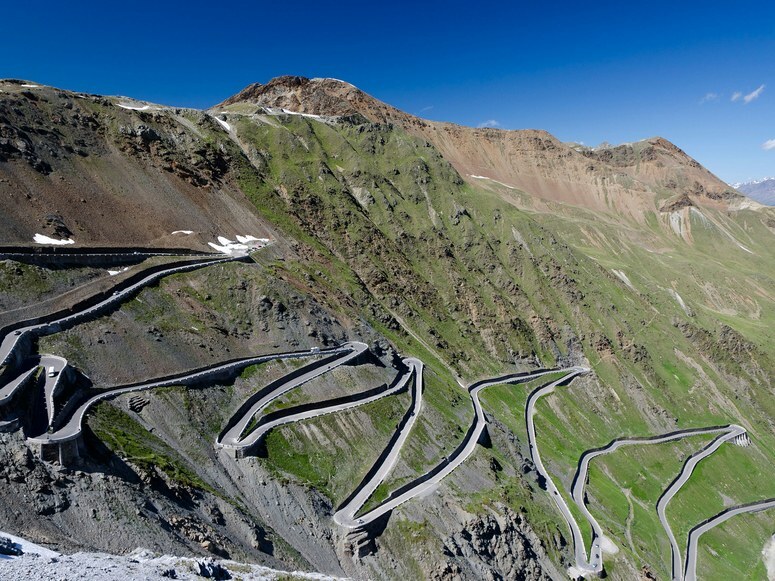 There are lots of ways to learn, and travel is perhaps one of the best. Preparations for the trip involved more than packing a toothbrush and hoping on a plane. 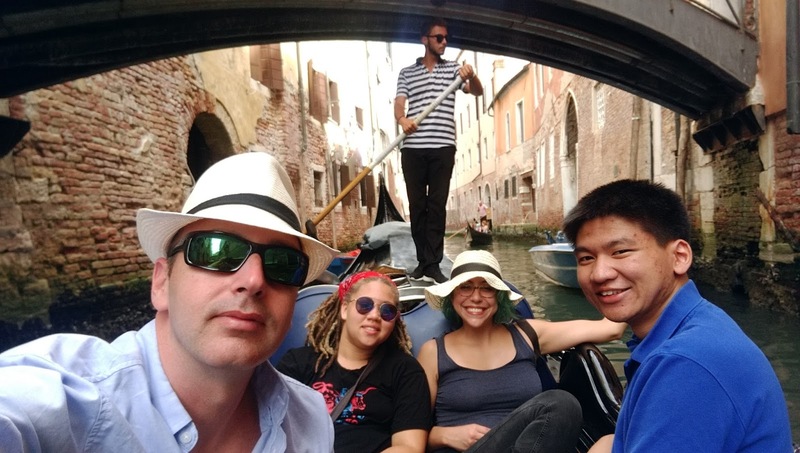 All students took an intense five week course, English 295: The American Romantics in Italy, created and taught by Reynolds Professor of English, Jane Rosecrans. The course covered 19th Century American Romantic writers, their travel to Italy, and the literature they created as a result. Additionally, Jane put together a packet of information on the language, the culture, and history designed specifically to add depth and perspective to the journey. What does it take to make an educational experience of a lifetime? Jane will tell you: "A year of intense planning, thought and hard work." Four-year schools frequently offer these programs, but this would be a first for Reynolds, and Jane’s vision was to make it an experience of a lifetime for those who may never get this opportunity again. Guidelines and policies had to be set up. Materials had to be created. 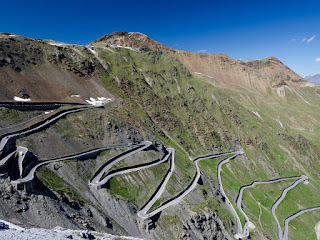 An affordable tour company had to be found that could fashion a custom tour based on Jane’s visits to Italy. And, perhaps most important, a whole new class had to be created. Aside from the details, Jane wondered, would the group get along? Would they pull together to meet the risks and unexpected challenges of travel? This group seemed to be charmed. Participants ranged in age from 19 to 69, but having the common thread of a shared adventure, they bonded immediately. 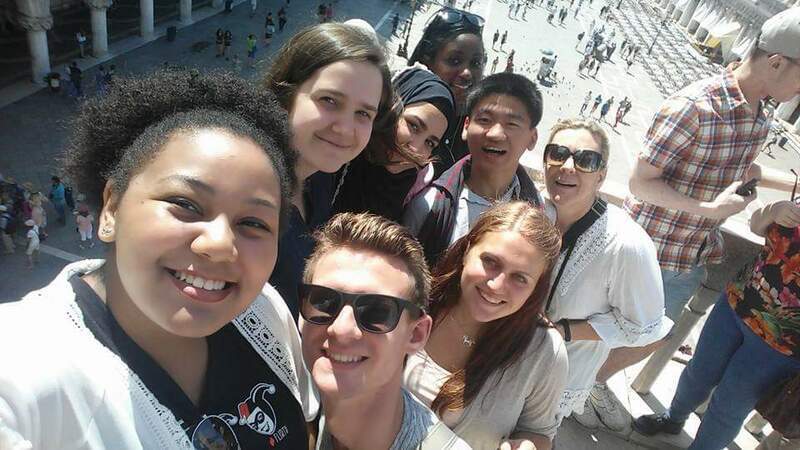 The group stayed several days in Italy’s main cities of Rome, Venice, Sorrento and Florence. Their “education” that had began in the classroom played out each day as they ventured on excursions, walking tours, lectures and sightseeing in Verona, Bologna, Orvieto (with a visit to the organic Altarocca Winery), San Gimignano, Ravello, and Pompeii. Highlights of the trip were the rollercoaster-like ride along the Amalfi Coast, a visit to the Venice Opera, and a gondola ride that lasted almost two hours (see photos below). Lessons learned extended beyond English literature, to economics, sociology and political science. Italy had a water shortage and a taxi strike during the trip. Yet, the students noted, in the face of shortages price gouging was never an issue among the Italians. Several weeks after the trip a follow up dinner was organized on Jane’s birthday. The bond formed abroad was still strong. The group laughed and joked as they remember all they had seen and learned. They concluded the trip was an experience of a lifetime, one they would never forget. The learning wasn’t over either. It had only just begun. From left to right is Jeff Delida, Sierra Peterson, Alexis Armand, and Brandon Tsay. From left to right (roughly) is: Gabby Hernandez, Madeleine Ownby, Joshua Briere, Saba Tahir, Shana Taylor, Brandon Tsay, Lorna Thwaites, and me. "Nature's Light: A Celebration of Color"
Richmond, Va. (October 6, 2017) - The Conference Center Gallery in the Workforce Development and Conference Center on Reynolds Community College Parham Road Campus will open its doors Monday, October 16 to showcase Coakley Brown’s art exhibit, “Nature's Light: A Celebration of Color.” The exhibit of 33 of Coakley's works will be on display through January 2018. Brown says, “At age four, I wanted to be an artist. I remember a relative telling me that as an artist, “You’ll have to wear a beret…” - I didn’t like that. I did enjoy creating art whenever I could. 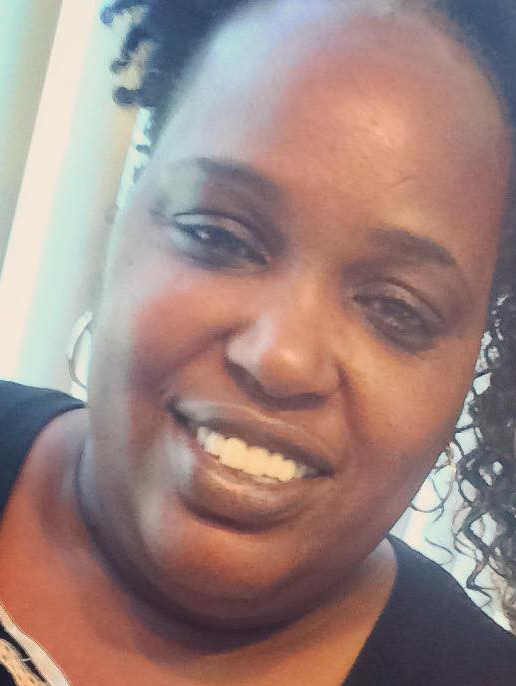 Nonetheless, teaching science and raising a family became my focus, a path that seemed most practical at the time. As a teacher and parent, I nurtured in students, my children, and myself, observation skills as a means of understanding and appreciating the natural world. As my children grew, “forced” ventures into galleries/art museums became a running family joke. Often, I was searching for pieces that I could not quite find. My family encouraged me to paint my own. Eventually, a wake-up call reminded me that as humans, none of us lives forever. The message: What are you waiting for? DO THE THING! As a representational artist, I am happiest when working with expressive brush strokes, capturing and exaggerating hints of color on canvas in a celebration of the light and color I see. Whether in the studio or field, my work is often inspired by nature. 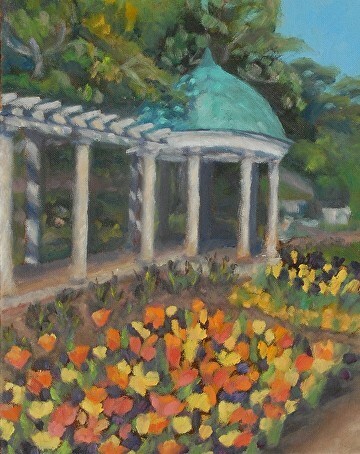 Painting directly from life en plein air ‘in open air’, brings me a bliss I relish sharing with others. I strive to produce work that is authentic, but not photographic in detail. There is a balance, I believe, where authenticity is achieved in the choice of details captured or omitted. The search for that balance, arriving at it, and searching again, is paramount to my artistic journey. The public is invited to the open reception Monday, October 16 from 6 to 8 p.m. For more information about this event or to schedule a tour of the collection, contact Karen Steele at ksteele@reynolds.edu. Are you from Richmond or did you come here from another city and state? I was born in Memphis, Tennessee. My Dad was in the Navy, but his family was here in Virginia. Full time for the last 11 years, part time for around ten years before that. The students, who come in all ages and backgrounds and have so many stories to tell. How did you get started as a welder? My first introduction was when I became employed as a mechanics helper at Reynolds Metals Extrusion Plant. One of the welders there first showed me how to strike an arc. What is the most challenging skill you teach to new welders? The ability to develop an eye for precision and detail, which will set them apart from the average welder. 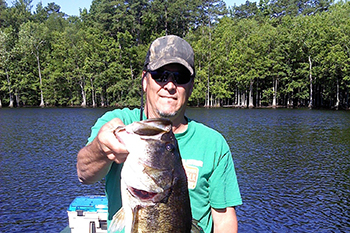 Hunt, Fish, and play Guitar. Students have told me I was the best teacher they ever had. Who is your most respected hero or heroine, and why? A toss-up between my Dad (86 now), and Theodore Roosevelt. They were both outstanding outdoorsmen, who were tenacious in all they strove to accomplish. Donald Cooper is one of 10. 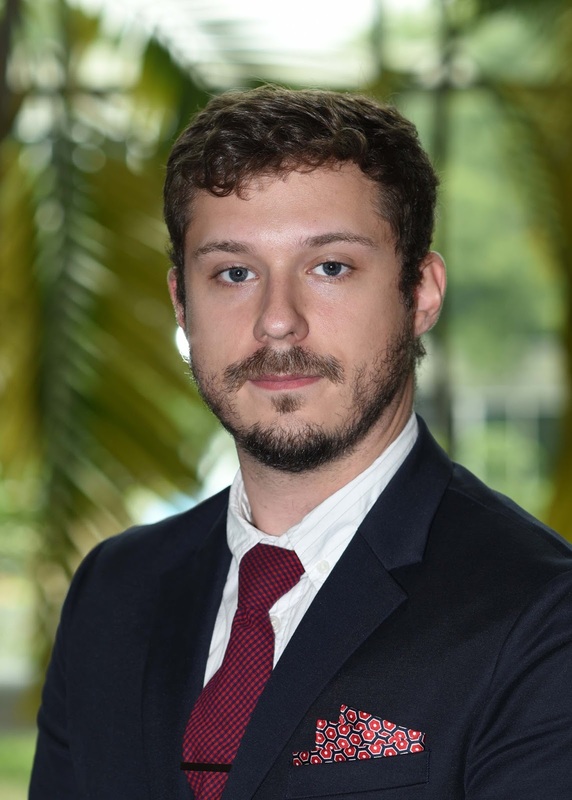 Of the more than 250,000 students served by the Virginia Community College System, he was one of only 10 selected as a Valley Proteins Fellow. That’s impressive. And even more impressive, this is the second year in a row a Reynolds student has been chosen for this prestigious program. “I am very grateful for the honor. I was up against a lot of candidates and the application process was a bit intimidating,” says Cooper. “Reynolds provided me with the tools and the opportunities, like the Valley Proteins program, to get an education.” The scholarship, combined with professional development, travel, and cultural opportunities, has an approximate value of $15,000. The core mission of the Valley Proteins Fellows Program is to help promising, second-year students at Virginia’s community colleges pursue their academic goals and strengthen their leadership skills. In addition to receiving full tuition, book expenses and fees, the Fellows participate in a unique curriculum of intellectual and cultural activities. The Fellows also participate in 80 hours of community service during the academic year to hone their leadership abilities and develop a strong foundation for future success, while maintaining a required minimum 3.5 grade point average. The fellows program is made possible through the generous support of Valley Proteins, Inc. The Winchester-based company has been in the rendering business for more than 60 years and currently operates plants in Pennsylvania, Maryland, Virginia, North Carolina, South Carolina, and Texas. The management of Valley Proteins is committed to outstanding corporate citizenship, excellent customer service, technological innovation and support for the community college mission. Serving over 18,000 students annually, J. Sargeant Reynolds Community College is the youngest and third largest of 23 community colleges in Virginia. The College operates three campuses serving residents in the City of Richmond and the counties of Henrico, Hanover, Goochland, Powhatan and Louisa. How long have you been at Reynolds? I have been working at Reynolds for over 16 years. What do you like most about Reynolds? I work in the office of Student Life as I love working with the students, and the freedom my office has to try new things. I also love the leadership opportunities we offer and making a difference in student lives here at Reynolds. What jobs did you have as a teenager? I didn’t work too much when I was high school - on occasions I would do babysitting jobs for my mom’s friends. I love hanging out with my friends and family. I am one of the youth advisers at my church. I’m also the adviser for our praise team and sing in two choirs. I also love doing volunteer work, so I often do that on the weekends. I love all the Transformer movies….except for the 3rd episode. Time Manipulation! All good times would last forever and awkward moments would never happen. I would go back and make changes to bad decisions. I could see people who died that I truly miss --- so yes time manipulation would be my super power. If you were given $5 million, what would you do? No brainer - I would help my family and friends. I would give to my church, help the homeless and donate to my schools….the list could go on and on. I love to see people happy, and if I could make someone else’s life easier by giving them money, I would it in a heartbeat. My fear of public speaking - I know people think because I like to talk all the time I don’t have a problem speaking, but I hate to stand up in front of a crowed and speak. What one word would you use to describe Reynolds? Outstanding! We have great opportunities for our students to succeed, I love the family feel here. It’s a great place to be. Congratulations to Reynolds Architectural and Engineering Technology students Michael Cintron and Charles Cabaniss for winning Phase I of the Blueprint for the Future: A Home for Everyone design competition. 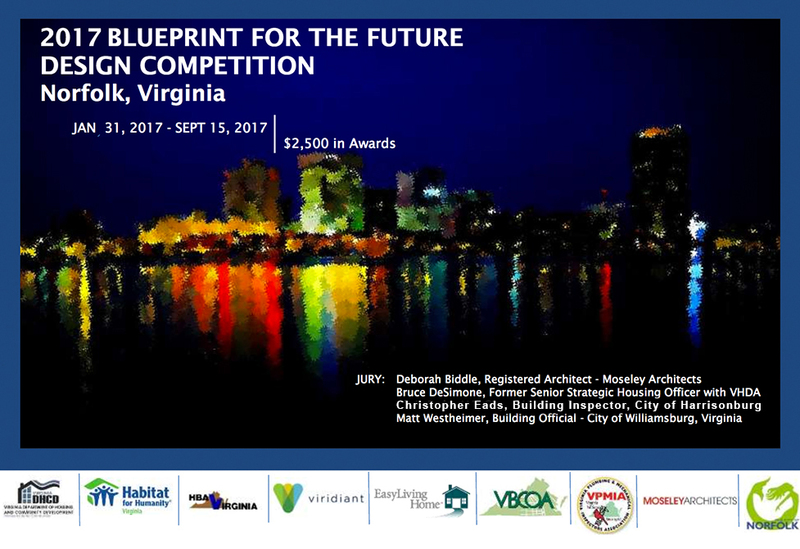 Michael and Charles will be recognized for their achievement at the Virginia Governor’s Housing Conference in November. This award demonstrates the high level of academic achievement of Reynolds students. The competition was open to students, amateur and professional architects and engineers. Michael and Charles competed against students from colleges and universities from across the state, as well as professional architects. 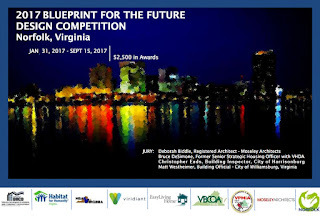 Sponsored by the Virginia Department of Housing and Community Development, Blueprint for the Future required participants to design a home that meets strict affordability, sustainability and accessibility criteria. The competition had two phases: Phase I involved meeting project and housing specs, and creating a site plan and drawings and Phase II required entrants to submit a design suitable for obtaining a building permit. Winners of Phase I advanced to Phase II. In addition to being a full time student, Michael currently works part time as a Gallery and Facilities Assistant at the Branch House Museum and as an embedded tutor at Reynolds. He plans to graduate in May 2018 with an AAS in Architectural and Engineering Technology with an emphasis on contemporary technology for design before continuing his education and earning a Bachelor of Architecture degree. Again, our congratulations to Michael and Charles for their accomplishments and to the faculty of the Architectural and Engineering Technology Department for their academic excellence. We wish Michael and Charles all the best in completing and submitting their Phase II plans. Richmond, Va. (September 28, 2017) – Reynolds Community College will host immigration lawyer Naureen Hyder at an “Around the World Through Books” discussion on Thursday, September 28, from 7 to 8:30 p.m. in the Lipman Auditorium of the Massey Library and Technology Center on the Parham Road Campus, located at 1651 E. Parham Road in Richmond. This event is free and open to the public. Canned goods for the Central Virginia Food Bank are requested. 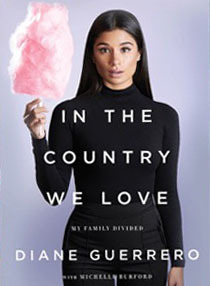 The book discussion will feature “In the Country We Love: My Family Divided,” by actress and author Diane Guerrero and Michelle Burford. Before acting in “Orange is the New Black” and “Jane the Virgin,” young American-born Guerrero experienced the trauma of her undocumented parents deportation to Colombia. The program is a free community event sponsored by Reynolds’s Multicultural Enrichment Council for the purpose of encouraging cultural diversity throughout the Reynolds campuses and communities. For more information about this event please contact Lisa Bishop (lbishop@reynolds.edu) or visit www.reynolds.edu. Serving over 20,000 students annually, J. Sargeant Reynolds Community College is the youngest and third largest of 23 community colleges in Virginia. The College operates three campuses serving residents in the City of Richmond and the counties of Henrico, Hanover, Goochland, Powhatan and Louisa. Richmond, Va. (September 22, 2017) – The Conference Center Gallery in the Workforce Development and Conference Center on Reynolds Community College Parham Road Campus will open its doors Friday, September 22 to showcase Sukenya Best’s art exhibit, “Dancing Ink.” The exhibit will be on display through Friday, October 6. Sukenya’s work involves the human figure, human contact, and audience participation. It is propelled by an appreciation for color, music, and dance. These elements are an autobiographical link to her family's history in the Caribbean Islands, New York City, and Central Virginia. Her process of creating artwork not only involves the mixing of cultures, but also the mixing of mediums. This includes printmaking, painting, and drawing. The combination of dance and print becomes a tool for communicating social issues regarding cultural interaction and division. In her innovative monotypes, Sukenya seeks to capture human rhythm, paths and patterns. To create her works, she collaborates with dancers who perform on an inked plate placed on the studio floor that captures the shift and weight of movement. 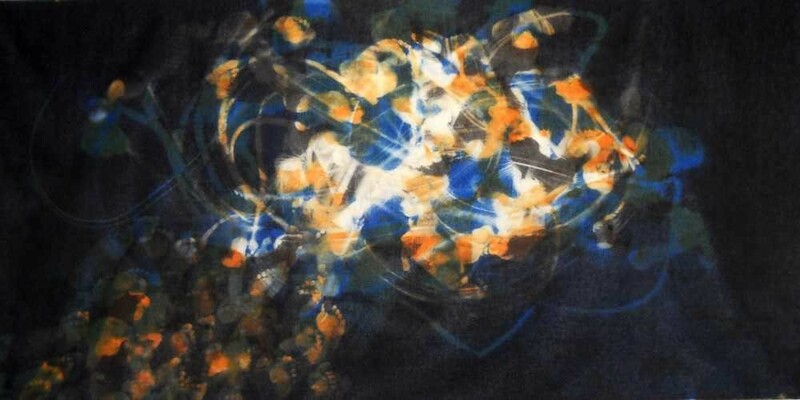 From the plate, she creates large monotype prints that record the dancer’s movements. The multiple colors of these prints are inspired by the dancer’s style or music choice. Her work, drawing from diverse cultures including the African diaspora, the Caribbean, and Spain, reflects the overlapping struggling and emerging cultures. The public is invited to the open reception Friday, September 22 from 6 to 8 p.m. For more information about this event or to schedule a tour of the collection, contact Karen Steele at ksteele@reynolds.edu. For the last few years, students, faculty and staff and visitors to the college have seen many bare walls at Reynolds covered with engaging and thought-provoking colorful art. Now it is time to check out the art outside at Reynolds! 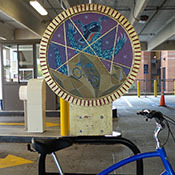 Find one of the 13 Reynolds Art bike racks and take a photo of yourself or with friends with the bike rack - post the picture to the Reynolds Instagram account by mid-night of September 8 and you could win a $25 Reynolds Campus gift card and a Reynolds Prize Pack! This contest is open to current Reynolds students, faculty and staff. Not sure what the Reynolds Art Bike Racks look like? Check out http://jsrevents.blogspot.com/. Official Rules: The winner will be notified via email. If a winner is unreachable after seven (7) days, or if that winner is unavailable for prize fulfillment, an alternate winner will be selected. Contest entrants agree to abide by the terms of these Official Rules and by the decisions of the contest judges, which are final on all matters pertaining to the contest. Entrants further grant to J. Sargeant Reynolds Community College the right to use any and all information related to the Contest for marketing purposes. We reserve the right to edit a submission prior to or after its approval, or refuse a submission deemed inappropriate, or of poor quality. Only one photo per person. For questions about the contest, email marketing@reynolds.edu.